New apartment, very spacious, furnished with care and attention. The apartment is about 65 sqm., It can accommodate up to 6 adults, on request a cot is available. It is located on the ground floor overlooking the garden. The apartment consists of 2 bedrooms, one double with wardrobe and one with bunk bed. In both rooms there is the possibility to add a bunk bed to increase the number of beds up to 6. Vigo Lomaso a typical town of the Giudicarie Valleys 2.5 km away. 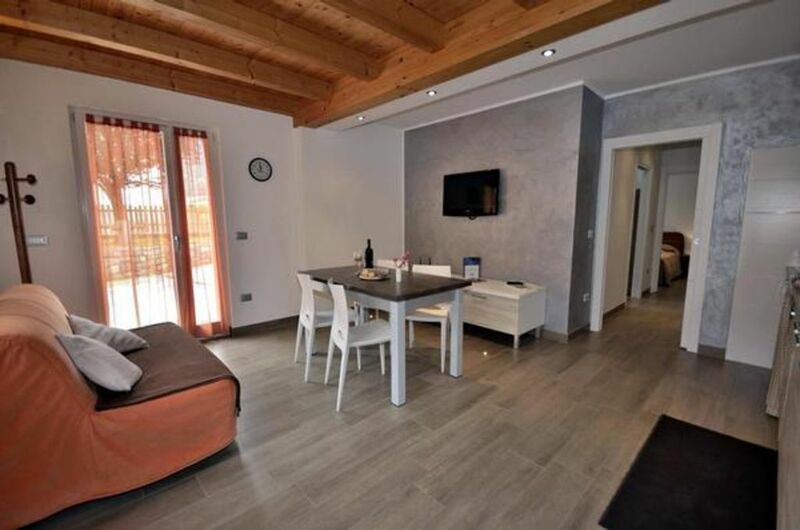 from Terme di Comano, and centrally positioned to major tourist attractions of Trentino, such Madonna di Campiglio, Andalo Paganella, Lake Garda and the city of Trento. The nearest railway station is located in Trento, about 25 km. away, while the nearest airport is in Verona (Valerio Catullo), which is about 95 Km., or Milan-Bergamo at 180 Km. Towels: once per person for rent at a price of 5 EUR (Mandatory). Bed linen: once per person for rent at a price of 10 EUR (Mandatory). Bed linen (once per person, vorhanden 10 EUR). Towels (once per person, vorhanden 5 EUR).